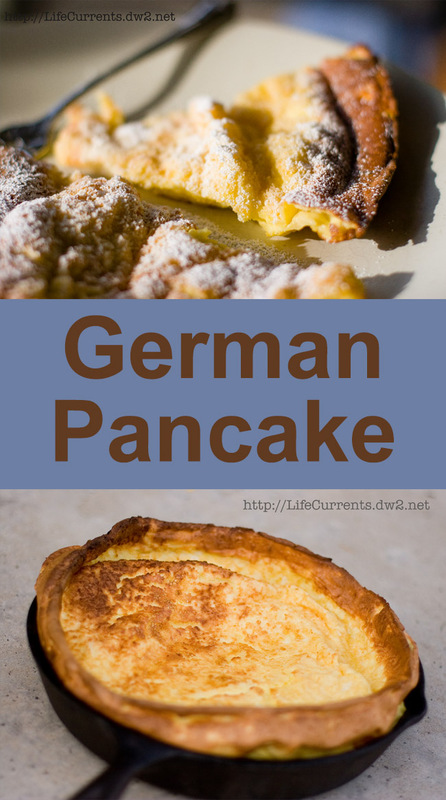 I love this German Pancake! It’s so easy to make, it’s impressive to look at, and most important, it’s really tasty! Just a few ingredients that you probably have in your kitchen right now, a little time, and you have yourself a delicious breakfast or brunch item! That’s why I included this in my Cupboard Cooking Cookbook. I like the pancake simply with the powdered sugar, however, you can also serve it with apple slices, strawberry slices, raspberry puree, or blueberries. Or, serve it with a little maple syrup if you like. Looking into the oven as the pancake puffs, see how high above the cast iron skillet this one rose! It’s also a really fun thing to make with kids, or childish adults, because it puffs so high in the oven, and then rapidly deflates after you take it out of the oven. Each one is different and fun too! Sometimes they rise more or less. But, it’s always a show. We’re working on some video that we shot of one in the oven; I’ll try to add that as soon as we get it all finalized. Preheat oven to 400°F. Place rack on the lowest shelf as the pancake will rise quite a bit. Whisk together eggs, milk, flour, sugar, and salt in a large bowl. Place butter in a 10-12 inch cast iron skillet, and place pan in the oven to melt the butter. Once butter is melted, remove the pan from the oven, and place whisked egg mixture in the hot skillet. Carefully transfer the hot skillet back to the 400°F oven, and bake for 20 minutes or until pancake is golden and puffed. Sift powered sugar over the top of the pancake and serve immediately. Don’t worry as it deflates - it’s supposed to do that. Pancake is also good at room temperature. *I use 2% milk, however any kind will work. Whole milk will make the pancake richer and heavier, while non-fat milk will make a lighter pancake. So, use the kind of milk your family likes best. At first, I love your blog….very well done, amusing, interesting and great recipes!!! The center of my pancake did not rise. This caused the cake in the center to be very dense. Still very tasty and good! Any suggestions on why it did not rise? The sides did but not the center. I’ve noticed that each pancake seems to have its own personality. Regardless of the fact that I always use the same pan, at the same temperature, and stir about the same amount, I find that each will behave differently. Sometimes they puff more evenly and sometimes they puff on the right or left or whatever. That being said, the pancake actually climbs up the walls of the pan (just like a souffle) as it bakes, so it really does usually rise more on the edges than in the center. If you look at the photo of the pancake baking (the one through the oven window, you can see the edges are higher than the center. Kinda hard to see, but it is there. We actually took a video the last time we baked one, and we have to process it, but when I post the video, I’ll link it here and maybe it’ll show the center a little bit more. And, when it comes out of the oven, it deflates almost immediately, so it generally is fairly dense by the time I’m eating. I’m really glad it was tasty and good! It is one of my favorites! Thanks so much for the comment. I love them so much that my mouth is watering as I look at this! My favorite way to serve this is with a little melted butter, fresh lemon juice, and powdered sugar! Yummy!! !